The U.N. Human Rights Committee concluded its 111th session July 25th. I'm experimenting with a format to offer a quick summary of context and relevant developments for these treaty body sessions. Please feel free to let me know what you think of this report. In the case of the Human Rights Committee, the Centre for Civil and Political Rights follows developments closely and also produces a report on each session. They are well worth following if you are interested in this treaty body. I'm going to take a slightly different approach than they do, but I would definitely recommend the CCPR's site too. The Human Rights Committee monitors compliance under the International Covenant on Civil and Political Rights (ICCPR). It meets three times a year, in March, July and October and has 18 members, half of whom are elected/re-elected every even numbered year. The last election was held June 24th, at which 6 new members were elected, 3 members were re-elected, and one replacement was selected to fill a current vacancy. The Committee is the second oldest in the UN human rights treaty system and receives the most numbers of individual complaints each year, claiming human rights violations of state parties. The treaty has been ratified by 168 countries, the most recent being the State of Palestine (ratified April 2, 2014). The individual complaint mechanism in the First Optional Protocol to the treaty has been accepted/ratified by 115 countries. The Committee met shortly after the General Assembly had concluded its treaty body strengthening resolution, aiming to increase resources and streamline processes to help the treaty bodies reduce backlogs, and improve state reporting and responsiveness to treaty obligations and treaty body requests. These developments were discussed in private session by the Committee and will no doubt have an impact on its proceedings in the future. Other political events happening during or shortly before this session included civil conflict in Ukraine, Iraq, Syria and the Gaza Strip; the kidnapping of over 200 girls by Boko Horam in Nigeria; continuing outbreaks of Ebola in central Africa; and the downing of Malaysian Airlines MH17 in rebel-held region of the Ukraine. The Committee reviewed six country reports during this session, decided 33 individual cases, and continued discussion and drafting of its new general comment on article 9 of the ICCPR (on the liberty and security of person). In addition it appointed its first rapporteur on reprisals, tasked to follow up on any reports from individuals who are threatened or persecuted after giving testimony to the Committee about human rights violations in a country before the Committee. No, there is no obvious response to the prior COs in the rpt. I couldn’t find anything in the TOC or in a skim through the report. Not applicable. This is an initial report. No, the periodic report is 18 pages over the limit; the common core report is okay. Annex of 45 pp is posted; other annexes are also noted to be on file. Each report was reviewed by the Committee and discussed with the government delegation. Heavy interest in attending the Ireland and Japan hearings required moving the hearing to the larger Palais des Nations meeting rooms. The Committee issued Concluding Observations on each report, from 7 to 9 pages in length, containing positive aspects and areas of concern. Counting sub-items, there were between 20 and 63 recommendations for each report. 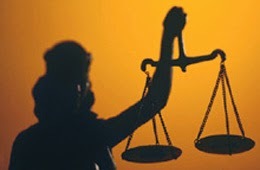 In each case several items were identified for followup by the government in one year. The next full report is due in 3 to 5 years, depending on the country. Here is a brief analysis of each concluding report. In addition to the six countries reviewed above, the Committee as usual also discussed upcoming reviews. They prepared lists of issues for upcoming reviews. These lists will soon be posted on the Committee website and will figure in the presentation and review of reports at future sessions. The last two countries, Mexico and Poland, have elected the so-called simplified reporting procedure in which the Committee is asked to submit a list of issues or questions beforehand and the state report will then be structured as a response to those questions rather than a full item-by-item summary of developments under each article of the treaty. This procedure is called the "List of Issues Prior to Reporting" (LOIPR) and will probably become more popular as time goes on. As noted earlier the Committee has announced that it has decided 33 new cases this session, but those decisions have not yet been released publicly. It usually takes one to two months before all of the decisions of a session are published. Once these decisions are available I will summarise them in a separate post on this blog. The background press release for the session indicates that there are now over 380 cases pending, representing about a 4 year backlog at current pace. This backlog problem has been a concern for some time now. The Committee has requested additional time and resources to reduce the backlog, but only received a positive response last fall before the UN General Assembly, A/RES/68/240. The program budgetary implications for this resolution indicated that 360 cases were pending at that time, 160 of which were ready for review and decision by the Committee but were simply waiting for staff support and working group time to consider them. The draft version of the resolution from the General Assembly had approved one additional week and corresponding staff support, for both 2014 and 2015, to support the Committee's efforts to reduce this backlog. However, the final version of the resolution granted only an additional week in 2014, and left open as to whether additional time would also be granted in 2015. We now know that the final GA resolution on treaty body strengthening in April this year also granted additional meeting time. So the Committee will meet for an additional week in the upcoming October session, and additional time will also be added to each of their sessions in 2015 for the same purpose -- to reduce the backlog of individual communications. It is also noteworthy to see how the Committee is allocating its time between its various tasks. With the heavy workload of individual communications, those are taking approximately 40% of the total Committee meeting time. All considered, this seems like a reasonable balance of schedule but if the backlog in individual communications is going to be significantly reduced in the near future, the Committee will obviously need to spend more time on individual communications as time goes on. The latest election was held June 24, 2014, NY, when 9 of the Committee members were up for re-election or replacement. A special election was also held at the same time to fill the vacancy left by the resignation of Mr. Matadeen of Mauritius, who resigned Jan 9, 2014. The election results represent major turnover from the existing committee membership and a small move toward greater gender balance (one more female than the prior committee composition). o the topic of geographic balance is addressed annually in a GA report on treaty body composition. In its 2013 report the GA report indicates that the Human Rights Committee is underrepresented geographically by the Asian Group and overrepresented by WEOG. o On gender balance the new committee, including newly elected members from June of this year, will have 5 women and 13 men on it – which is below the average and only 5th best in the system (excluding CEDAW which is overbalanced with women). The Committee's 112th session will be Oct 7-31, 2014. This session will last an extra week in order to reduce the backlog on individual communications. 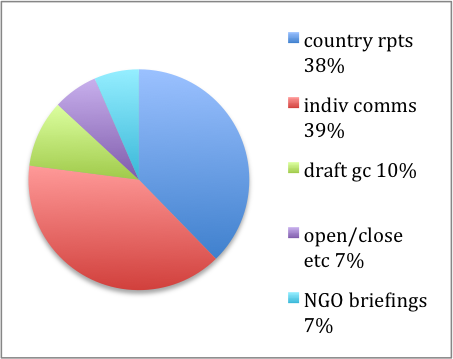 For NGOs who would like to submit information that will be considered by the Committee at its 112th session, the deadline is September 12 for country reports to be reviewed, and was July 25th for preparation of lists of issues (although late submissions after this date may be accepted if sent as soon as possible).